Prior to A Hard Day’s Night, rock and roll musicals were a disreputable lot consisting of Alan Freed “extravaganzas” which were mostly excuses to bring early rock and roll singers like Little Richard, Gene Vincent and Chuck Berry along with Doo-Wop groups such as The Flamingos and Frankie Lymon and the Teenagers on to the big screen surrounded usually with the simple idea of putting on a big show for the kids against the wishes of parents, teachers, local town leaders and other narrow minded authority figures. Not much better were the Elvis movies, though some of his early films (King Creole, Jailhouse Rock, and Flaming Star) reflected signs of an untapped acting talent up there on the screen. Disappointingly, by the time A Hard Day’s Night arrived, Elvis’ films had been reduced to the stale pabulum formula of Fun in Acapulco, Kissin’ Cousins and It Happened at the World’s Fair, generally with songs just as bland and forgetable as the titles (The Bullfighter Was a Lady, Barefoot Ballad, Cotton Candyland). Other films during this period, the early 1960’s, exploited the Twist dance craze (Hey Let’s Twist, Don’t Knock the Twist, Twist Around the Clock). Then there were the A.I.P. Frankie and Annette Muscle Ski Bikini Pajama Beach Party movies which were not much better. So in July 1964, when a small black and white film starring the English mop tops was released, the only thing anyone was expecting was a lot of money to be rolling into United Artists bank account. Then it happened! Right from the earliest frames, as soon as you heard the first note of the title song, you could tell this was not going to be just another standard run of the mill Elvis/Beach Party rip off. Here was a film with sardonic wit, shot and edited by filmmakers in an exhilarating cheeky, hip, innovative way. Director Richard Lester, who previously worked with producer Walter Shenson on The Mouse That Roared, was an American living and working in London since the 1950’s. Lester bought in Liverpudlian screenwriter Alun Owen who he previously worked with in television. Owen, at this point in his career, was probably best known as a co-screenwriter of The Criminal, an excellent film directed by another ex-pat American living in England, Joseph Losey. 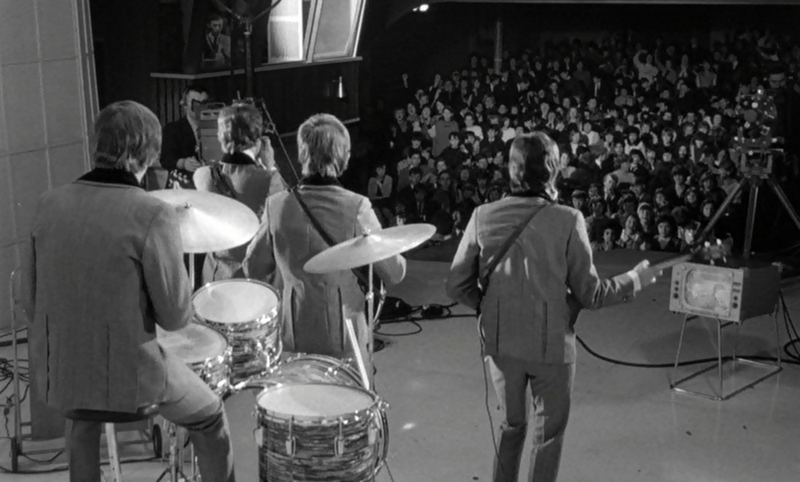 Before shooting a frame of film, Lester and Owen traveled with the group during a few of their European concerts. They observed not only the audiences reactions to the group, but how the four interacted with each other during the tour. It gave Owen the idea for his script, a day in the life of the most popular group in the world, prisoners of their own extraordinary fame. 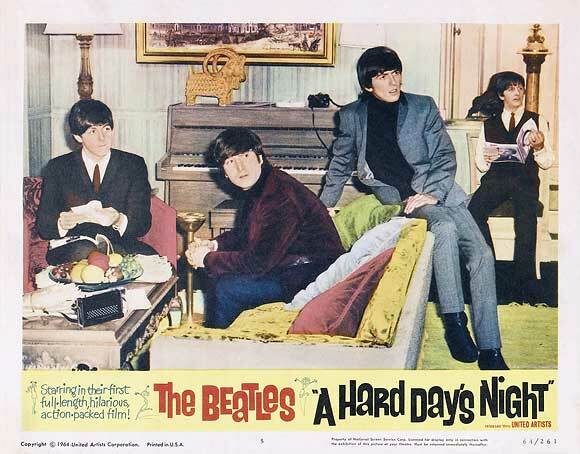 A Hard Day’s Night is filled with youthful exuberance, irreverence and the then latest Lennon-McCarthy compositions. Lester’s use of the hand held camera in many scenes gives the film an in your face, you are there, documentary feel. The boys’ cheeky humor fills the film with an us against them mentality, much like the Marx Brothers in their best work. Early in the film, a stuffy gentlemen, riding in the same train compartment as the boys, demands they shut off the radio informing them he is a regular rider and has his rights. When George responds back that they have rights too, the man answers, “I fought the war for people like you.” “Bet you’re sorry you won,” is the boys response. 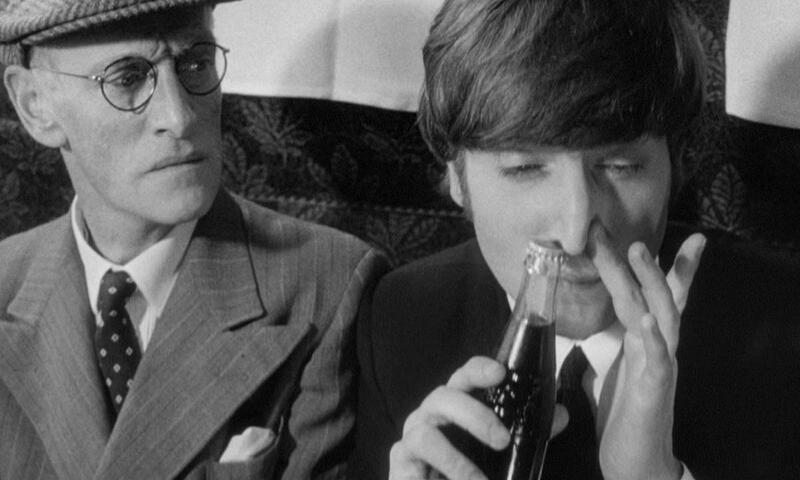 Lennon then stares at the older man and whines, “Give us a kiss.” Interestingly, neither John, Paul, George or Ringo, according to Richard Lester biographer Andrew Yule, saw a Marx Brothers movie until just before they began to work on their second film, Help. The film was Duck Soup. The Beatles world is one filled with two types of people. First, the hordes of teenagers, real life fans, mostly girls screaming, chasing, and pushing forward in an uncontrolled frenzy attempting to get close to their idols. Second, are the suits, the establishment, which is just about everyone else in the world, but here represented by their manager and TV director. The pandemonium is constant and Lester with his hand held camera captures the feel of it all. There were a few times it got a little too real during the filming of some scenes as the group had to dodge past screaming mobs who would get a little too close for comfort. Lester meanwhile kept calm and kept the camera rolling capturing it all. Lester’s editing was innovative, influencing future filmmakers for generations to come. 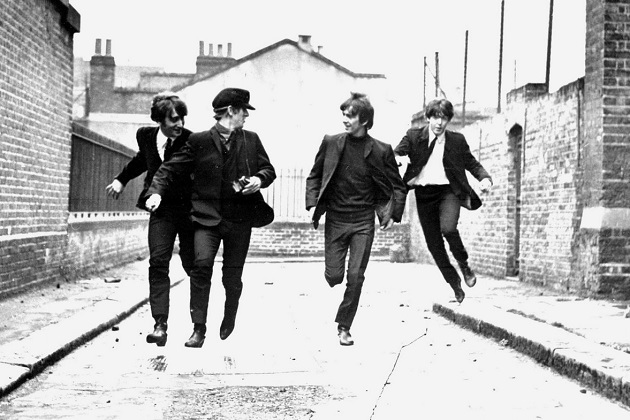 The running, jumping, falling sequence of Can’t Buy Me Love and the early train sequence of the group playing cards in a baggage car with a smooth quick shift to performing I Should of Known Better, were revolutionary and its technique and style gave birth to the modern music videos we take for granted today (There were short promotional films made by record companies prior to A Hard Day’s Night, but they were mostly just of the singer or the group standing there and performing.) Many years later MTV would pay tribute to Lester for his influence on the modern day music video. Today, these ground-breaking techniques may seem a bit of a cliché after thousands of music videos and feature films copying the style. (1) Among the screaming fans were a young teen, and the future drummer of Genesis, Phil Collins, as well as teenage girl named Patti Boyd who would become George Harrison’s first wife. She appears in the I Should Have Known Better sequence. 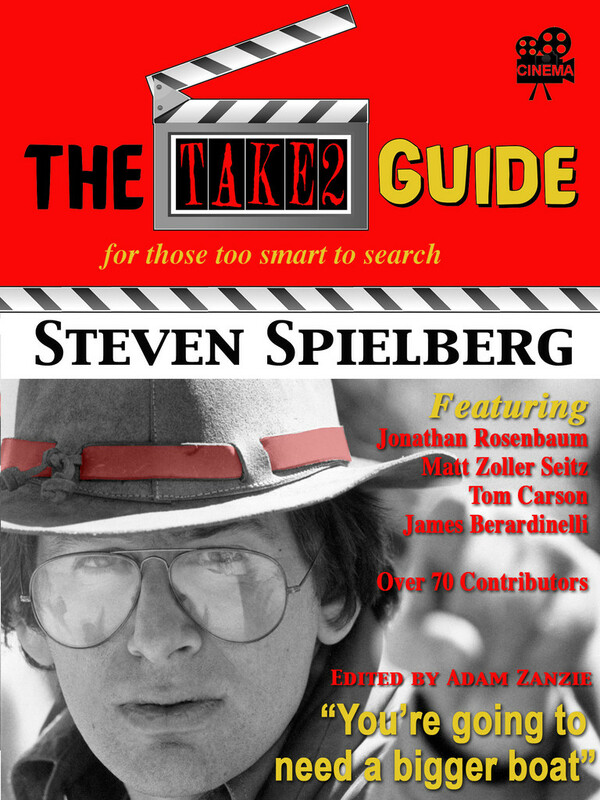 This is my contribution to the Criterion Blogathon. Check out other fantastic entries by clicking on the link below. 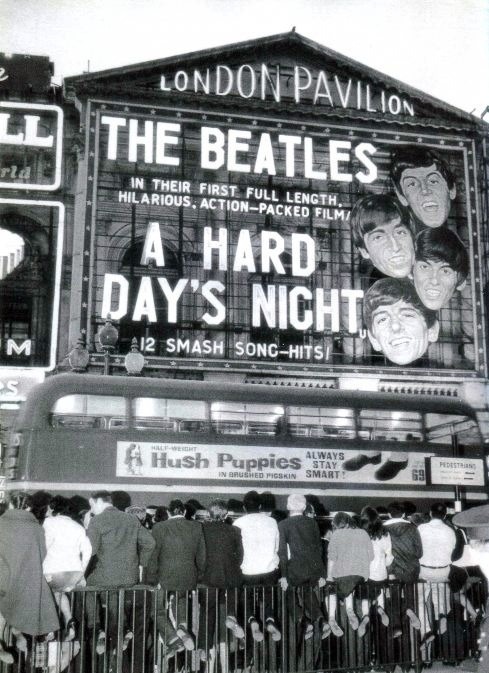 This entry was posted in 1960's, Musical and tagged A Hard Day's Night, Alun Owen, George Harrison, John Lennon, Musicals, Paul McCartney, Richard Lester, Ringo Star, Ringo Starr, Rock and Roll, The Beatles. I love the term “the Citizen Kane of juke-box musicals.” Fabulous! It’s been many years since I’ve seen this, and I’ve seen it only once, but I thought it was a smart, cheeky film. Your description of the four being prisoners of their own fame is a good way to describe the film. Thanks for providing the background info for this film, and thank you for joining us! So true, instead of being just another rock & roll musical or extended music video this became a fine movie, and always fun to revisit.Great post and many t hanks for being part of this event. Thanks! Glad to have been part of the event. I love this post, John. A spot-on description of the music and teen-targeted movies up to that time and the low expectations everyone – except Beatle fans like me, who didn’t care, we just wanted more Beatles – had of their first film. I remember the fan euphoria that followed the film’s release – we were so proud that the movie was more than good, it was great. The “Citizen Kane of juke-box musicals,” indeed! I watched A Hard Days Night again not that long ago for the first time in years. It really holds up well and reflects that particular moment in time beautifully. We were fortunate to have been young then. Back to the movie. It does hold up well and perfectly captures the times, the innocence sand th pure joy of it all. I’ve heard some good new music over the past few years, too, John, thanks to 20-something relatives of mine. But even they, who are into music from earlier decades and varied genres, seem amazed at how much good music there was back in the day vs. not so much today. The 60’s was truly a creative period. A fantastic, passionate labor of love here John! Like you I hold this film in the highest regard, and I also applaud your unique framing that it is the “Citizen Kane of Jukebox Musicals!” Great stuff! Of course the film has held sway decades later, and it is unquestionably Lester’s best work. The kinetic energy, deft editing and masterful score speak for themselves. Just great work here John! 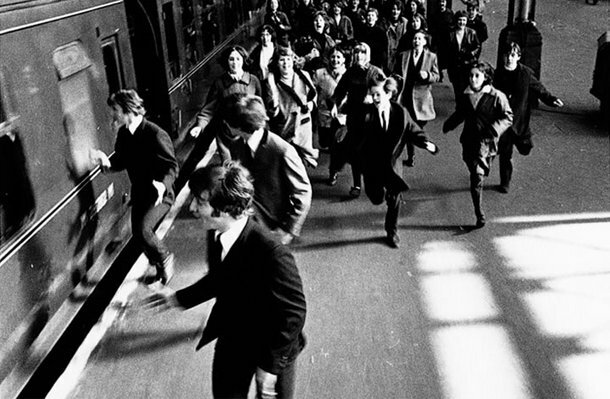 A Hard Day’s Night is a feel-good movie. It is nothing to be taken too seriously, and it is highly entertaining. I loved how you mentioned the other musicals who were in fashion in the early 1960s. 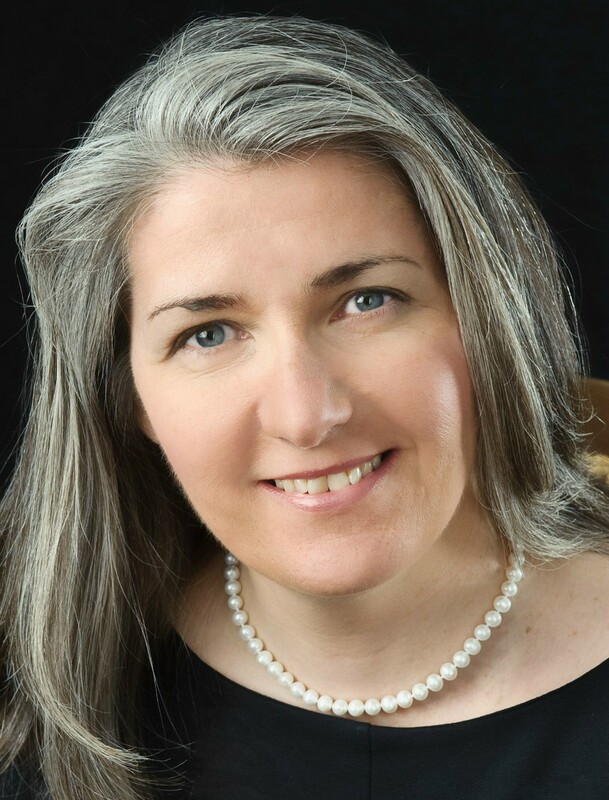 Very good article!